Psyduck is a Water type Pokémon introduced in Generation 1. It is known as the Duck Pokémon . The effectiveness of each type on Psyduck. In Generation 1, Psyduck has a base Special stat of 50. In Generations 1-4, Psyduck has a base experience yield of 80. 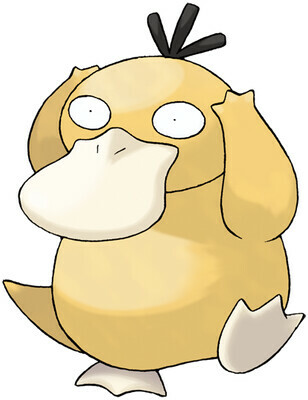 If it uses its mysterious power, PSYDUCK can’t remember having done so. It apparently can’t form a memory of such an event because it goes into an altered state that is much like deep sleep. If its usual headache worsens, it starts exhibiting odd powers. It can’t remember doing so, however. This Pokémon is troubled by constant headaches. The more pain it’s in, the more powerful its psychokinesis becomes. Psyduck learns the following moves in Pokémon Let's Go Pikachu & Let's Go Eevee at the levels specified. Psyduck learns the following moves in Pokémon Ultra Sun & Ultra Moon at the levels specified. Psyduck learns the following moves via breeding in Pokémon Ultra Sun & Ultra Moon. Details and compatible parents can be found on the Psyduck egg moves page. Psyduck can only learn these moves in previous generations. It must be taught the moves in the appropriate game and then transferred to Pokémon Ultra Sun & Ultra Moon. Where can i find a psyduck on grassland in pokemon Diamond. Why do wild Pokemon's levels vary most in water?